The All of Us series is a friendly sit com that explores a break up of a marriage and having to survive the best way that can be expected. The opportunity of humor is unending and creates a lot of fun for the viewer that many can relate to. This loosely humorous drama is based on real family situations, which bring the writing a good solid base. 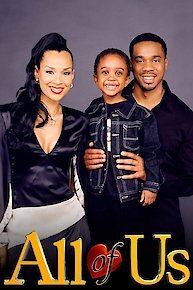 The creator and executive producers Jada Pinkett Smith, Will Smith has based this funny sitcom on their own family experiences. Robert goes with Neesee to attend her mother's wedding. The couple get mistaken for Beyonce and Jay-Z and use that to their advantage. But pretending to be a powerful couple brings them together in an unexpected way. Robert finds out that Neesee is planning to visit a sperm bank in order to have a baby and questions her reasoning for going through with the procedure. Michelle accompanies Neesee to the sperm bank for support and Neesee makes a decision that could affect the rest of her life. Neesee invites Robert on an all-expense paid trip to her mother's second wedding in the Turks and Caicos Islands. Robert and Neesee make an unexpected stop in a small town where they are mistaken for Beyonce and Jay-Z. Later, Neesee and Robert make a decision about a second baby that could alter their relationship. Robert begins to spend time with a single mother, Kate and her son Patrick, upsetting Bobby, who thinks his father is should be spending more time with him. Courtney is heartbroken after her boyfriend breaks up with her. Dirk has a hard time comforting Courtney and seeks Neesee's help and advice. Dirk is still upset with Robert over their on-screen fight and refuses to speak to him. Needing a friend, Robert turns to Ben, the man Neesee has been dating, and begins to spend more time with him. Neesee confronts Robert about stealing her man and encourages him to make up with Dirk. Before Robert can apologize, his boss makes a decision that affects Dirk's career. During his 15th college reunion weekend, Robert finds himself attracted to Deborah Cooper, a professor he had a crush on back in his college days. Hoping to meet an eligible bachelor at the reunion, Neesee reconnects with Fitz Escoffrey, a national television sports reporter. Robert believes Fitz stole his successful career when he tripped Robert during a college basketball game and made the game-winning basket. Wanting to settle the feud, Robert challenges Fitz to a one-on-one basketball game, but injures himself before the game while trying to romance Professor Cooper. A store manager catches Bobby stealing sneakers, which he wanted so he could fit in with the popular kids at school. Meanwhile, Neesee babysits her neighbor's newborn niece and realizes how much she enjoys caring again for an infant. Bobby cheats on an aptitude test and then gets more than he bargained for when he's asked to take part in an annual academic competition. Meanwhile, Neesee's new friend sets her up on a date, but Neesee discovers that the man has a strange fetish. Neesee's condo is ready, but Bobby objects to being shuffled between both homes so, for his sake, Robert and Neesee decide to take turns living in the condo. Meanwhile, Courtney has a crush on an older man who works with Dirk. Episode 11 - Let's Go Bobby, Let's Go! Neesee comes from the wedding of a friend who found happiness with an overweight man, and she vows to accept a date from the next man who asks her out---which turns out to be a very short man who works with Robert. Robert is ecstatic when peewee indoor football begins for Bobby, but is flustered when the boy comes home and announces he's a cheerleader. Robert tells Bobby he can't go to his Fireside Kids jamboree for being disrespectful to Dirk, but Neesee thinks the punishment is too harsh and takes Bobby on the trip behind Robert's back. Meanwhile, Courtney introduces her boyfriend to Dirk. Episode 7 - Like Father, Like Son, Like Hell! Returning home from meeting his biological father, Robert remains stunned that his real dad, Luther, is gay. Though he tries to hide this fact from his family, Luther and his partner unexpectedly show up. When Courtney shows her lack of interest in spending the holiday with Dirk, Neesee offers her some motherly guidance. Finally, the entire family sits down to have a Thanksgiving meal to remember, prepared by Neessee. Robert has an identity crisis after his dad stuns him with news about his family history, prompting him to search out an estranged relative in Las Vegas to help him come to terms with his personal dilemma. Robert and Carmen celebrate their father's 60th birthday and discover a startling family secret. Meanwhile, Neesee helps Courtney prepare for a school dance. While hosting a charity bachelor auction, Neesee wins a date with an eligible, handsome and rich doctor--but the date doesn't go as well as she had hoped. Neesee finds a new condo to move into, but Robert finds out that it's still under construction and won't be completed for a while. Robert's sister comes for a visit and asks to stay at the house but, knowing that his sister and Neesee don't get along, Robert realizes that one of them has to go. Meanwhile, Robert and Neesee help Dirk get Courtney into Bobby's school, but Courtney ends up causing a bit of trouble with the other students. Robert and Neesee struggle to deal with a letter that Robert wrote her four years earlier, apologizing for the final argument that lead to their divorce, and how it will impact them now. Meanwhile, Bobby discovers a hair "down there", forcing Robert and Neessee to discuss puberty with him. Dirk's life is turned upside down when his 13-year-old daughter, Courtney, arrives to live with him while her mother travels abroad. Robert's sister, Carmen, returns from India with a deeper perspective on life and tries to own up to what she feels is her part in Robert and Neesee's split. She then sets out to get them back together, and her efforts cause Robert to look back at his wedding day and the final argument that caused the split. Robert has a sobering case of adulthood when he meets his new girlfriend's father and must deal with an injury Bobby acquired while fooling around on his motorcycle. Meanwhile, Dirk's former flame, Beverly, tries to get him to reach out to the teenage daughter he recently learned he had, but dealing with a teenager proves to be more of a challenge than he realized. Robert tries to rediscover the fountain of youth by dating a college-age girl and buying a motorcycle after his doctor gives him a tough reality check. Meanwhile, Dirk collides cars with his ex-girlfriend Beverly, during which time some old information from the past comes to light. Bobby shocks everyone at his birthday party by blurting out the N-word, causing a discussion among the adult chaperones over how to handle the situation. Enlightened by a trip to India, Robert's sister, Carmen, returns to make up for past mistakes, which includes feeling responsible for Robert and Neesee's divorce, so she attempts to reunite them by putting them in romantic settings.Meanwhile, prompted by Carmen's efforts to bring the former spouses together, Robert reflects back on their wedding day and the big fight that ultimately ended their marriage. Robert's quest for youth gets a reality check when he meets the father of his young girlfriend, Daphne, and when he finds out that Bobby got hurt while playing on Robert's new motorcycle.Meanwhile, when Beverly encourages Dirk to connect with his newly discovered daughter, Courtney, he struggles to fit into the role of daddy to a mouthy teenager. After a disturbing visit to the doctor's office that makes him feel old, Robert tries to rediscover his youth by getting a motorcycle and dating a young college girl.Meanwhile, Dirk's fender bender with his old flame, Beverly, is double the trouble when a shocking secret is revealed. When Bobby uses the N-word at his birthday party, a neighbor initiates a debate about its use, and Neesee and Robert have to find a way to explain the history of the word to Bobby. When Robert starts dating Bobby's new karate teacher, Kammy, the bond between father and son is tested as Bobby, who also has a crush on her, decides to make his own move to win her over.Meanwhile, in an effort to impress a new lady love, Clarinetta, Dirk turns to Neesee for help in the kitchen with some last-minute cooking lessons. When Neesee "borrows" Robert's new assistant, Kenny, without his permission, it triggers an escalating feud between the former spouses over how they take each other for granted as roommates.Meanwhile, after Robert encourages him to spice up his social studies report by turning it into a rap, Bobby is inspired to become a rapper and begins to call himself Lil' B.
Robert's visiting sister spends a lot of time with Dirk, who falls for her and showers her with gifts. Then Robert discovers that she is playing his friend just for the attention and the presents. Filled with the holiday spirit, Robert convinces Neesee, against her better judgment, to let her ex-con brother, Vonte (guest star Alex Thomas), spend Christmas Eve with them. Meanwhile, Robert tries to turn around Dirk's negative thoughts about the Christmas holiday. Despite warning Neesee about getting involved with a married man, Robert finds himself stuck in the middle of the affair when both her new beau and his wife pay him a visit.Meanwhile, Dirk is excited about the baby-making process with Jonelle, but he's caught off guard by how calculated she is about the right time to conceive. Robert is surprised to learn Neesee is dating her business lawyer, especially when he learns that Neesee knows that the lawyer is married.Meanwhile, even though they are no longer together, Dirk convinces Jonelle to have his baby. Bobby wants to be a white kid after attending a private school, which makes Neesee and Robert shocked that now they have to teach him to take pride in being an Black African American. Bobby decides to give Dirk love relationship advice while Neesee and Robert find two attractive lovers on an internet connection online service. after her apartment burned down and moving in with Robert to take care along with him Bobby Jr. Neesee finds a burned down restaurant and decides to open up a business in order to get her life back up together again. After the heartbreaking ending relationship with Tia to find out she's pregnant and losing his job and everything, Robert decides the only way to pull his life right back together is by starting over again which means he and Neesee must learn to get along together, that is when Neesee moves in with Robert because her apartment burned down. All Of Us is currently available to watch and stream on The CW. You can also buy, rent All Of Us on demand at Amazon, Vudu, Google Play, iTunes online.